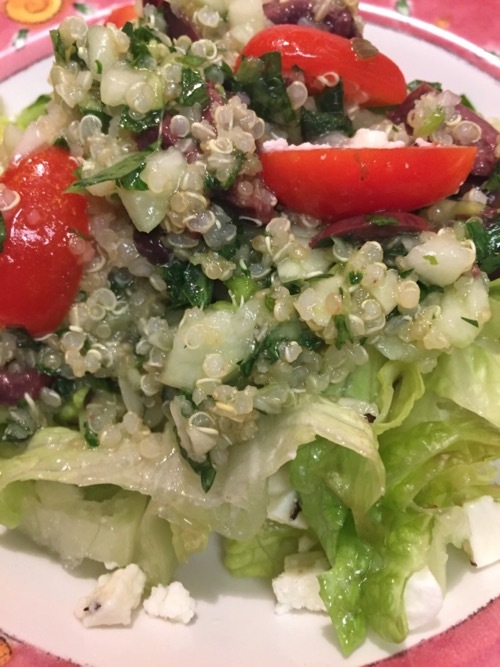 Refreshing Quinoa Tabooli Gluten Free is a good choice for a side salad with 2 handfuls of leafy greens. 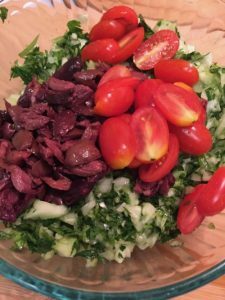 Tabooli, a mid-eastern salad, was one of the first “new” foods I tried in my first detox. The doctor I worked for, Craig Roles, DC at Green Valley Chiropractic, and his wife Suzy, took great delight in introducing me and other staff members to new foods. 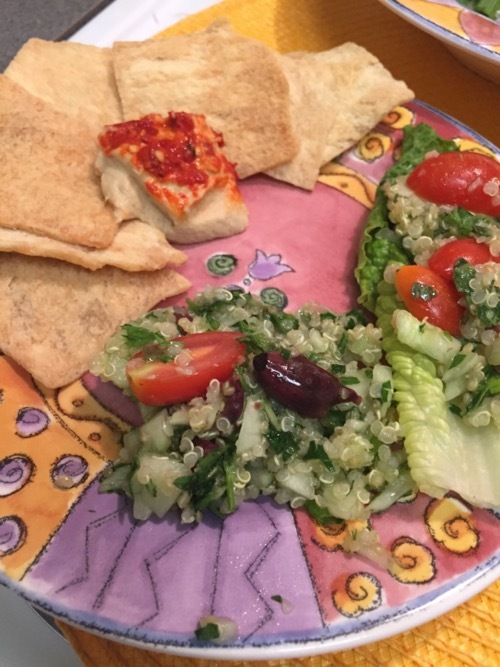 He ordered an authentic Greek meal from the deli across the street and I was hooked! How about this for a cooling summer meal? L-R Quinoa Tabooli and Hummus appetizers, Refreshing salad with quinoa tabooli, pepperoncini and Feta drizzled with olive oil and balsamic vinegar, Lemon rosemary roasted chicken, potatoes and veggies. 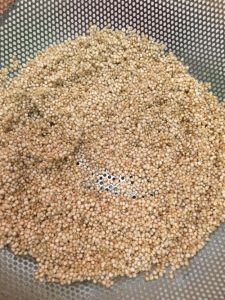 Quinoa makes it gluten free! 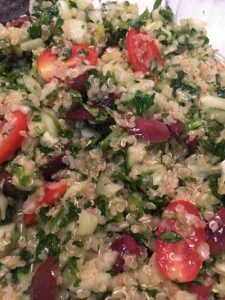 I discovered during that detox that my body does not tolerate wheat, so I created this recipe with Quinoa, which is equally delish! 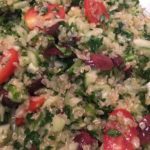 Refreshing Quinoa Tabooli Gluten Free is not only a refreshing salad with lots of textures and flavors, it has some interesting nutritional value. Quiona is actually a seed and is moderately aklaine. 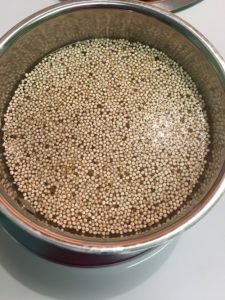 Quinoa is an excellent protein and fiber as well. 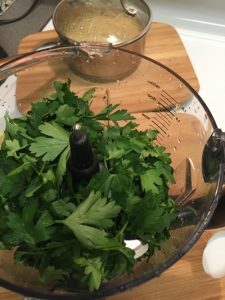 Parsley, the star of Tabooli, is a Super Food! 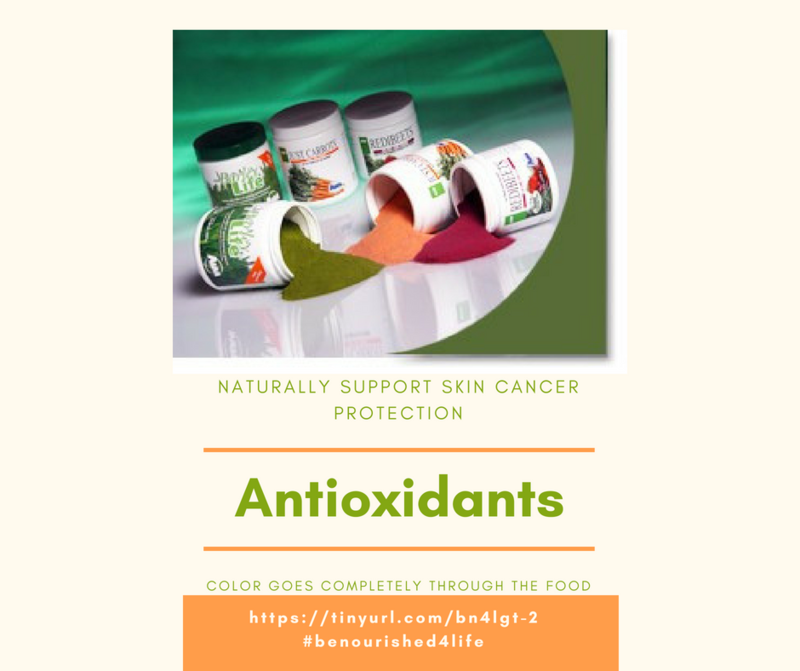 Antioxidants are cells produced by your body and found in food and plants that protect the cells and reverse cell damage by settling free radicals and oxidation. Free radicals are cells that are out of balance, I recently heard our AIM microbiologist, Phillip Jerman, call free radicals “angry cells”. Free radical cells, aka “oxidation” are out of balance because they have lost neurons that keep them balanced. Free radicals tend to bounce around and damage other cells. Antioxidants are super hero cells containing an unlimited amount of neurons. They are happy to give the free radicals a neuron to settle them down and help them to function normally. Antioxidants typically have an unlimited amount of neurons to share. I’m sure you’ve read about antioxidant drinks, formulas, vitamins, etc. However, the best source of antioxidants are whole foods. You can tell an antioxidant food by its color. An antioxidant will be brightly colored with the color going completely through the food. For instance, tomatoes are red all the way through, they are an antioxidant, as are berries, citrus, greens and broccoli. Radishes, zucchinni and apples are an example of nutritious foods that are not high in antioxidants; the color is on the outside but not the inside. The parsley and lemon juice and basil and mint and tomatoes in Refreshing Quinoa Tabooli Gluten Free are all antioxidant foods, making this a great choice for overall health and to protect your skin in the summer sun. The AIM Garden Trio are three juice powders that are high in antioxidants and enzymes, made up of the juice of young Barley grass, carrot juice and beet juice. The Garden Trio provides the nutrients of 5 pounds of vegetable juice, replete with enzymes and antioxidants to alkalize, nourish and protect your body. The best part about the Garden Trio is how easy it is to make. Just add the juice powders to a shaker cup with water, drink and rinse out your cup…takes about 30 seconds to get an entire day of vegetable nutrition. 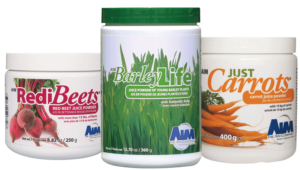 The AIM Garden Trio is part of our daily nutrition. To serve Refreshing Quiona Tabooli Gluten Free in a bowl, line the boal with lettuce leaves, add the Tabooli and garnish with pitted olives and a sprig of parsley. For a unique appetizer, fill romaine hearts with Quinoa Tabooli Gluten Free, garnish with chopped greek olives and some crunchy quinoa. 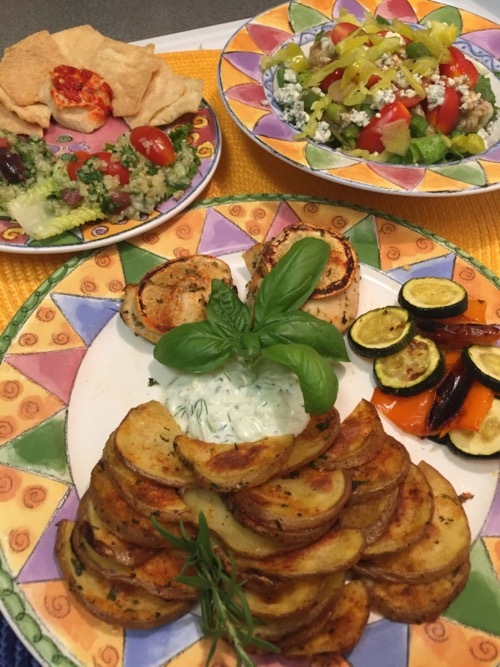 “Greek Tapas” For a refreshing appetizer on a hot day fill small plates with with hummus, pita and cucumber chips and Quinoa Tabooli. If you want to be completely gluten free sub the pita chips for colorful mini peppers. 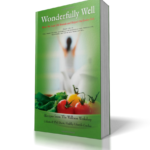 This recipe was first published in our book Wonderfully Well, How We Lost 132 Pounds and Helped Our Bodies Heal, available on amazon.com. A flavorful gluten free version of traditional Tabooli you will love. Cancer protective, high in antioxidants, refreshing and flavorful. 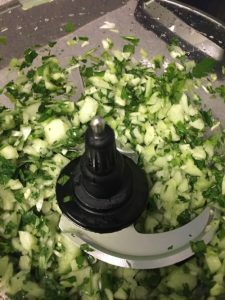 Using a food processor with the S Blade, Chop parsley and basil, and mint, add garlic and pulse to a fine chop. Add cucumber, and green onion, pulse until cucumber and green onions are chopped. Add Greek Olives, chop slightly. Pour chopped ingredients into a large bowl. Add sliced cherry tomatoes. Be sure to only pulse the food processor a few times when adding each food. You want to chop it not pulverize or liquify it. No Food Processor? No Worries! These ingredients can also be chopped with a knife and cutting board.